The Red Label wig collection offers incredible flexibility with natural looking wigs with a hand made base and the finest European human hair, multi-directional skin tops and wefted handmade backs. Get more for your wedding! 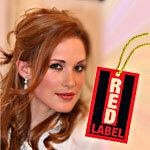 Don't forget to mention ChossonKallah.com when visiting Red Label Wigs.